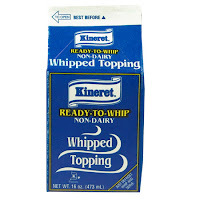 Non-dairy whipped topping. It is amazing what chemistry can do. This product is supposed to taste like something it isn't supposed to be. The ingredients used to do so are terribly unhealthy, and it doesn't taste good. Yet it beckons with its cream-like texture and appearance. Don't be fooled.. Check out the ingredients: Water, hydrogenated palm kernel, oil, sugar, cellulose gum, polysorbate 80, disodium phosphate, vanillin, artificial flavor, annatto. I tried to keep Izzy's little fingers out of the stuff but I was unsuccessful. He managed at least one dip into its sickly sweet allure. *Note to self: Replace flavor imprint with real whipped cream this week!